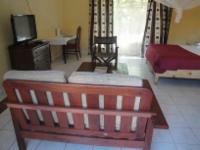 Wild Trekkers Lodge offers comfortable and clean accommodation in a peaceful suburb. The lodge is only three minutes’ drive from the misty Victoria Waterfalls, and four minutes’ drive from the town centre. The accommodation is ideal for families, couples and business traveller.The bed and breakfast accommodation is provided in a Family Rooms, four Standard Rooms and three Superior Rooms. Each room is well equipped and furnished with king-size or twin beds, have en-suite bathrooms, TVs with DStv and a mini fridge.Guest have access to free Wi-Fi, secure parking and a restaurant. The restaurant has a wide selection of local and continental meals on its menu. An airport shuttle service, car hire and laundry service is available on request. Budget accommodation with a bed only rate is available on request. Bed only rates are available on request. Superior Room Sleeps 4 Includes: B & B Rooms / Units: 3 Spacious Superior Room with king size bed, min bar fridge, free Wi-Fi and DSTV. En-suite bathroom with bathtub. Standard Room Sleeps 3 Includes: B & B Rooms / Units: 3 Spacious Standard Bedroom with 1 x Queen bed and 1 x single beds. Free Wi-Fi and DSTV. En-suite bathroom with bathtub. For the price,everything should be improved,noisey fans cockroaches in every room,advertised DSTV non existent,tea and coffee station not consistent in all rooms,no bath water at times,in total not very impressed. Wild Trekkers Lodge is 1.9km from the centre of Victoria Falls , the nearest airport 18.4km (Victoria Falls International Airport).